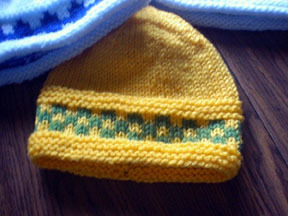 This darling two colored hat is so easy to make! Size 8 (16") circular needle, and set of double point or whatever size you need to get the gauge. Row 1: Knit 6, K2 tog. Row 7: Knit 2, K 2 tog. Repeat until 5 stitches remain. To finish off you can knit 2 more together and then knit those 4 stitches for 3" into an I cord, fasten off and tie to top of hat making a loop or fasten off the fives stitches and add a three strand braid to the top of the hat in the two colors or add a matching pom pom. 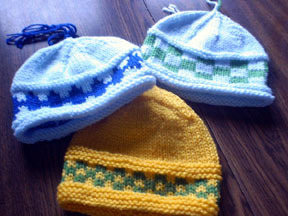 Please finish the hat for Ship Support by cutting off the yarn 10" long, run through the stitches and fasten off. The guys prefer nothing on the top so the hats can fit under their helmets. Fasten in all yarn ends. To make I-cord : Knit 4 on a double point, slide stitches to end of needle and knit those 4 stitches again. Repeat until desired length. It will make a hollow tube. for 6 or 8 rows makes a great variation!